Concerning the officers of the whale-craft, this seems as good a place as any to set down a little domestic peculiarity on ship-board, arising from the existence of the harpooneer class of officers, a class unknown of course in any other marine than the whale-fleet. The large importance attached to the harpooneer's vocation is evinced by the fact, that originally in the old Dutch Fishery, two centuries and more ago, the command of a whale-ship was not wholly lodged in the person now called the captain, but was divided between him and an officer called the Specksynder. Literally this word means Fat-Cutter; usage, however, in time made it equivalent to Chief Harpooneer. In those days, the captain's authority was restricted to the navigation and general management of the vessel; while over the whale-hunting department and all its concerns, the Specksynder or Chief Harpooneer reigned supreme. In the British Greenland Fishery, under the corrupted title of Specksioneer, this old Dutch official is still retained, but his former dignity is sadly abridged. At present he ranks simply as senior Harpooneer; and as such, is but one of the captain's more inferior subalterns. Nevertheless, as upon the good conduct of the harpooneers the success of a whaling voyage largely depends, and since in the American Fishery he is not only an important officer in the boat, but under certain circumstances (night watches on a whaling ground) the command of the ship's deck is also his; therefore the grand political maxim of the sea demands, that he should nominally live apart from the men before the mast, and be in some way distinguished as their professional superior; though always, by them, familiarly regarded as their social equal. Now, the grand distinction between officer and man at sea, is this- the first lives aft, the last forward. Hence, in whale-ships and merchantmen alike, the mates have their quarters with the captain; and so, too, in most of the American whalers the harpooneers are lodged in the after part of the ship. That is to say, they take their meals in the captain's cabin, and sleep in a place indirectly communicating with it. 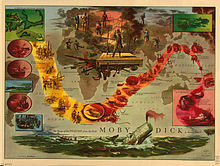 Though the long period of a Southern whaling voyage (by far the longest of all voyages now or ever made by man), the peculiar perils of it, and the community of interest prevailing among a company, all of whom, high or low, depend for their profits, not upon fixed wages, but upon their common luck, together with their common vigilance, intrepidity, and hard work; though all these things do in some cases tend to beget a less rigorous discipline than in merchantmen generally; yet, never mind how much like an old Mesopotamian family these whalemen may, in some primitive instances, live together; for all that, the punctilious externals, at least, of the quarter-deck are seldom materially relaxed, and in no instance done away. Indeed, many are the Nantucket ships in which you will see the skipper parading his quarter-deck with an elated grandeur not surpassed in any military navy; nay, extorting almost as much outward homage as if he wore the imperial purple, and not the shabbiest of pilot-cloth. Nor, perhaps, will it fail to be eventually perceived, that behind those forms and usages, as it were, he sometimes masked himself; incidentally making use of them for other and more private ends than they were legitimately intended to subserve. That certain sultanism of his brain, which had otherwise in a good degree remained unmanifested; through those forms that same sultanism became incarnate in an irresistible dictatorship. For be a man's intellectual superiority what it will, it can never assume the practical, available supremacy over other men, without the aid of some sort of external arts and entrenchments, always, in themselves, more or less paltry and base. This it is, that for ever keeps God's true princes of the Empire from the world's hustings; and leaves the highest honors that this air can give, to those men who become famous more through their infinite inferiority to the choice hidden handful of the Divine Inert, than through their undoubted superiority over the dead level of the mass. Such large virtue lurks in these small things when extreme political superstitions invest them, that in some royal instances even to idiot imbecility they have imparted potency. But when, as in the case of Nicholas the Czar, the ringed crown of geographical empire encircles an imperial brain; then, the plebeian herds crouch abased before the tremendous centralization. Nor, will the tragic dramatist who would depict mortal indomitableness in its fullest sweep and direct swing, ever forget a hint, incidentally so important in his art, as the one now alluded to.